DAVID Linker stands over a Louis XIV bureau Mazarin like a surgeon over a car-wreck victim. The pine body, once fit for a monseigneur's dressing room, is chipped and lusterless. 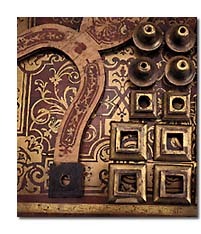 The legs, detached and lying on a nearby table, suffer gouges where someone tried to remove whole panels of marquetry. That marquetry -- tortoiseshell inlaid with engraved brass, once ornate and as reflective as a mirror -- is cracked and peeling; in places it is missing altogether. Linker shakes his head. "The restorer the owner took it to nearly butchered this thing. This is terrible; he never should have touched it. He should have said, 'This is not what I know.'" It is what Linker knows. 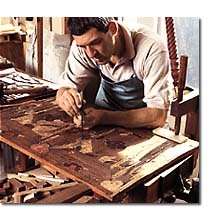 He is an ébéniste, a French-trained descendant-by-profession of the furniture makers for the Kings of France. Linker, though, generally doesn't build new furniture but rather specializes in restoring antique pieces. An American, he has taken on the estimable challenge of practicing ébénisterie in an era when mass production has rendered it anachronistic and in a city, New York, whose language has no word for it. arose in the middle of the seventeenth century. It was named for ebony, an important element in the art of marquetry, in which decorative patterns are created with various materials and inlaid on a veneer of ebony or other wood. The ébénistes, who at first handled only marquetry but later acquired other skills as well, made French craftsmen the toast of Europe. Their ilk survived the French Revolution, the Industrial Revolution, and the assembly line, but at the end of the twentieth century not many of them ply their trade in Paris, much less on West 18th Street. There are other furniture restorers, of course, many of them highly skilled, but few trained for years in Paris to take their places in an ancient guild. As far as Linker knows, in fact, he is the only French-trained ébéniste in New York. In his eighth-floor Chelsea workshop he and his assistant restore to their glory artifacts of other eras. There is a 1920s Belgian gold-and-tortoiseshell cabinet that was handed down through a Dutch Jewish family, hidden during the Second World War, and shipped to America several years ago; an 1840s Italian table that Linker found, underappreciated, at a Connecticut antique sale; and a nineteenth-century Spanish Renaissance table rescued from an Upper East Side Dumpster. There is also the bureau Mazarin (named for a seventeenth-century French cardinal), which was shipped to Linker by a client in Houston. Linker's clients range from wealthy collectors to families with prized heirlooms, and he has restored pieces at New York's Gracie Mansion and Trinity Church. Yet in Linker's business word of mouth travels slowly. Few people realize that this kind of work is still being done, and fewer still are willing to pay for the hundreds of hours typically needed to restore a piece with the fastidious perfectionism of the ébéniste. "People today have an industrial-era mentality," Linker says. "What we do in this shop is from another era. When people hear about this, they just don't believe we exist." WHEN Linker muses, "A created object discloses itself to us, and our workshop master taught us to read that object as we read a book," he sounds like a dubbed French film. His accent is vintage Far Rockaway, from the Queens neighborhood where he grew up in the late 1940s and 1950s. (When he speaks on the phone to Parisian friends and colleagues, as he does several times a day, he sounds simply like a French actor.) He spent much of his childhood working in his family's extensive vegetable garden and, with his brother, taking things apart and putting them back together. But his father, a Jewish immigrant from Chernovtsy, in what is now Ukraine, who owned a grocery store and later drove a taxi for twenty-five years, made it clear that the boys should become professionals. Accordingly, Linker studied French literature at City College and then headed for Paris to continue his studies at the Sorbonne. Linker had every intention of becoming a professor, but, he says, "I had a whole change of spirit when I got to France." He was struck by the skill and attitude of tradesmen of all sorts. A waiter in a café, for instance, "was not a waiter studying to be an actor, he was a waiter in a café," he says. "And he was proud of it, and he was happy." When student protests disrupted the university in 1968, Linker traveled to England, where he found housing on the Portobello Road, London's enormous outdoor antiques center. He repaired furniture to make ends meet, and after a Dutch friend introduced him to the master of a well-known furniture-making school in Holland, he began a four-year training course there. It was in Amsterdam, in the back of the school's workshop, that Linker first met people who were studying to become furniture restorers -- a line of work he had never even considered. "I knew the light had finally gone on in my brain," he says. "I saw what I had been trying to arrive at, what I somehow innately wanted to do." Although Linker didn't know it at that time, his grandfather had been a furniture maker in Chernovtsy; indeed, the trade probably went back generations in the family. Oblivious of this heritage, Linker finished his schooling in furniture making while also completing an apprenticeship with a billiard-table maker. He then returned to Paris, where he joined the famed Cour de Varenne, a workshop specializing in the restoration of France's royal furniture. There he evolved from journeyman to ébéniste. Content in his calling, in a country where he felt more at home than he did in Queens, Linker eventually came to run the restoration workshop of the Parisian decorator Henri Samuel. "I never wanted to come back to America," he says. But with the election of the Mitterrand government in 1981 he was unable to renew his work permit. Reluctantly he returned to New York, and established his own workshop in Brooklyn. By the late 1980s the business was flourishing under the patronage of several major clients, including John T. Dorrance Jr., who had been the chairman of the Campbell Soup Company from 1962 to 1984. Linker became the official restorer of Dorrance's estate in Pennsylvania, and last year he moved his workshop to a sunny 2,500-square-foot loft in Manhattan. What he moved there, and what he continues to assemble, is a collection of tools, stock materials, and potions worthy of an alchemist's den. For replacing missing marquetry elements he has seashells, tortoiseshell, brass, gold, copper, silver, bone, ivory, and various skins, including shark and stingray. One wall of shelves holds his dyes. He has oil-soluble dyes for coloring waxes and alcohol-soluble dyes for touching up color-degraded shellac finish. For wood he has water-soluble dyes, which produce a more penetrating and beautiful natural tone. And to fill in holes he has nonsoluble dyes, which he melts together with hard shellac. The recipes for these dyes have been passed from master to master down through the centuries. Only occasionally will Linker deviate from them. "I have one recipe that calls for ten kilograms of nails, some vinegar, and then you're supposed to go to the shed and get a bucket of horse urine," he says. "Well, I'm not going to put nails in vinegar and urinate on it. I know it's just ferric sulfate and uric acid, so I use the chemicals directly." Next to the dyes are myriad waxes, which enable Linker to reproduce virtually any wax finish he comes across. For instance, to restore a 1630s ebony-veneered Flemish cabinet that once belonged to Rudolf Nureyev, he will mix a black dye with beeswax, palm wax, and paraffin to produce a malleable but very hard wax of just the right hue. Then there are the glues. Standing over a small gas stove like a witch from Macbeth, Linker mixes glues made from bones, nerves, and hides to produce the appropriate adhesive for a 300-year-old commode. When he needs to glue brass, he calls on another ancient trick: mixing garlic with the molten glue, or rubbing cloves against the back of the brass, provides just the right stick. When gluing onto a flat surface, Linker places a hot zinc plate on top to warm the marquetry, the glue, and the base surface together. For a more challenging surface -- for example, a curved leg -- he heats some sand and pours it into a cylindrical cloth bag. 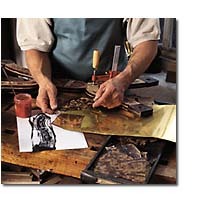 Clamps hold the leg, the marquetry being glued onto it, a protective layer of paper, and the sandbag. As the leg, glue, and marquetry heat up, the pores in the leg open fully to take in the glue. The entire assembly then cools down, forming a peerless bond. The star attraction in Linker's cast of treasures, though, is wood. In a back corner of his loft lie shelves full of seemingly ordinary planks. They could be from any carpenter's garage -- except that some are centuries old, and some are all but impossible to buy today. One bundle of planks is from the floor of a 1604 Amsterdam house that was being destroyed when Linker lived in that city; he saved the wood and carried it with him to France and then to America. He has accumulated a variety of wood great enough that he can almost always repair his damaged antiques with the genuine article. If, for example, a client should bring him a desk made of Cuban mahogany -- a species depleted centuries ago by European loggers -- he would have no problem filling its holes and gouges without resorting to a substitution. Squatting down, Linker retrieves from the back corner of the bottom shelf a foot-long cylinder of heavy dark wood. "I bought it from an old marquetry shop in New York that was going out of business," he says. "The owner was from Germany, the last of his line." He turns the wood over; penciled on the bottom is "Cuba Mahogany, 500 years old." Restoring the original body, glue, and marquetry, however, is but a prelude to Linker's final act. He walks to a set of jars, opens one, and gently shakes the cloud of orange flakes inside. "Touch that," he says. "Feel how soft it is." These jars contain shellacs for use in a process called French polishing -- the crowning touch on most of Linker's work. The shellacs are resins secreted by the lac bug of southern Asia and then scraped off trees. French polish, which was first developed in the mid eighteenth century, is a solution of this shellac in alcohol. Gently rubbing it into wood lets the alcohol evaporate, leaving a fine clear layer that is nonpareil in feel, look, and durability. Applying French polish is not as easy as it may sound. "It takes years to become an expert French polisher," Linker says. "And that's if you have the talent. Some people can do it, some can't. Graham has the skill." He's watching his assistant, Graham Davis, polish an 1840 Victorian tabletop. Davis went to work for Linker after interning for him during a high school summer-jobs program ten years ago. As he makes circular motions with a soft cotton or linen rag wrapped around a wadding of wool, the alcohol evaporates off the surface in an evanescent mist. "The shellac that's left," Linker says, "is like a breath. You can't even measure it." "It's the simplest thing in the world, but it's the most difficult thing in the world," he continues. "Everybody calls their work French polish now, but it's not." The difference is not in the materials but in the technique. The polisher must learn exactly how much pressure to apply. Squeeze too hard and too much alcohol will seep out, burning or dulling the shellac. Not enough muscle and there's no effect: many valuable hours can be wasted. There's no way to fake years of training by a master. "You see it in the Yellow Pages," Linker says, "but that's not real French polish." It will take about twenty-four hours to French polish the small Victorian tabletop. A larger piece might require a hundred hours. 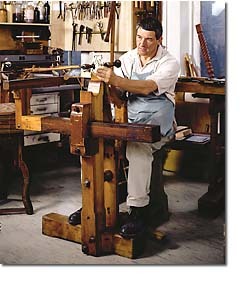 For example, Linker and Davis will polish a bureau for days, working on one part while the shellac on others hardens -- thousands of circles of the forearm, leaving microscopic coat after coat, until, Linker explains, "finally the thickness of feel and evenness is there, and it gets to a point when you know that's exactly enough." The result, displayed on several finished pieces in a small gallery in the workshop, looks like a sylvan mirror and feels like butter would if it could be hard and warm at the same time. "TO restore an object," Linker says, traversing his loft to show off his projects in various states of reconstruction, "you have to learn from it how it was made, and then you have to interpret it. There's an enormous communication between you and the object." Linker's devotion to his craft, his ascetic surrender to the demands of an ancient discipline (along with his flat Roman haircut), brings to mind a Benedictine monk. His workshop is his monastery, Davis his lone disciple. It wasn't always this way. In the mid-1980s Linker had, in addition to Davis, eleven journeymen from all over Europe working for him, along with a chief, or second-in-command. But now his great clients are gone; John Dorrance, whose private collection alone could support a full workshop, was one of a rare breed that, as Linker puts it, "had exquisite taste and understood that furniture should be more than an investment -- it should be a personal monument." Without that kind of steady, bountiful patronage Linker can't afford to keep a full house of trainees. "My trade," he says, "which flourished for centuries, is being wiped out by people's attitude: the bottom line. Even though a piece of furniture has been neglected for ninety years or more, they want you to repair it in a few hours." As if on cue, the owner of the bureau Mazarin shows up. She's in town for a few days and has arranged to drop by to discuss her piece. Her elegant blonde coiffure and swank attire clash with Linker's workmanlike jeans and apron as he cheerfully leads her off to look over her investment. Seeing it dismantled on several tables, she seems taken aback. Linker calmly delivers his prognosis. First he'll have to clean each part carefully, cutting out the damaged brass and tortoiseshell and saving as much of those elements and of the old glue as possible. Then he'll need to replace the wood that has been gouged out and fill in the chips and holes, making all surfaces perfectly smooth. He'll repair the brass and tortoiseshell bit by bit, replacing missing tortoiseshell with stock from his collection and cutting new bits of marquetry on his eighteenth-century-style marquetry saw, guided by rubbings and photocopies of the existing elements. Then he'll glue everything back onto the body of the bureau, using a carefully pigmented glue. Finally, when everything is intact, he will apply the French polish. His estimate: a thousand hours of work, or more, at ninety dollars an hour. Fifteen minutes later he escorts his client to the elevator and returns. "She couldn't put the proper amount of money into it," he explains. "She wanted to cut it into little pieces, make a little night table with part of it, frame some of the marquetry and put it on the wall. My heart sank." Rather than surrender the bureau to such a barbaric intent, he persuaded her to sell it to him for $7,000. It was a tidy profit for her, and Linker, after a couple of years' work, might be able to sell it for ten times as much. "If I can part with it, that is," he says. "I hate to part with my work after I've sweated over it for years. But I have to start doing that now." DAVID Linker's struggle is not merely to keep a small business afloat but to sustain a dying art. In an age of computer-designed furniture and reverence for the disposable, his is an endangered species. "I trained for a particular trade," he says, "and in that trade there is a balance and a harmony, a respect. There is life worth preserving, there are ideas worth preserving, and there are trades worth preserving. Still, it all goes back to the question you asked earlier: What does it mean to be an ébéniste in New York? I ask myself that question all the time. Why do I do this? Why do I put myself through this?" Even as he speaks, the answer is at his fingertips: they absently caress the surface of an Alsatian walnut armoire from 1630, which he restored a few years ago. The answer is in the perfect patina, the resplendent shine, the soft, warm feel of the finish -- like seventeenth-century flesh brought back to life.